So there is a bit of a mini-commotion on the Twitter and on some blogs about "wasting" one of the Oilers' 50 contracts on an entry-level contract for Travis Ewanyk. Jonathan Willis does a decent job of going over this and defending his position over at Oilers Nation. Now, if I can combine a few things I've done, I'd probably come to a different conclusion. It's not a sure shot in the least, but it's probably not a complete waste. According to my draft study, in general, you're probably looking at around a 10% chance for your major junior pick from round 3 to 7 to turn into an everyday contributor in the NHL. That's exactly what Ewanyk is — he was drafted in the third round, 74th overall by the Oilers in the 2011 draft. Furthermore, in that "study" I did, I had highlighted a certain type or "style" that had disproportionate success to the odds. So while in terms of pure raw numbers, Moen comes in as the only successful comparable ever (and thereby making it appear signing Ewanyk is a terrible proposition), I can use this as an opportunity to use what I've gleaned. As I stress time and time again on this blog, spreadsheets aren't scouting. Scouting is going to games and watching games. 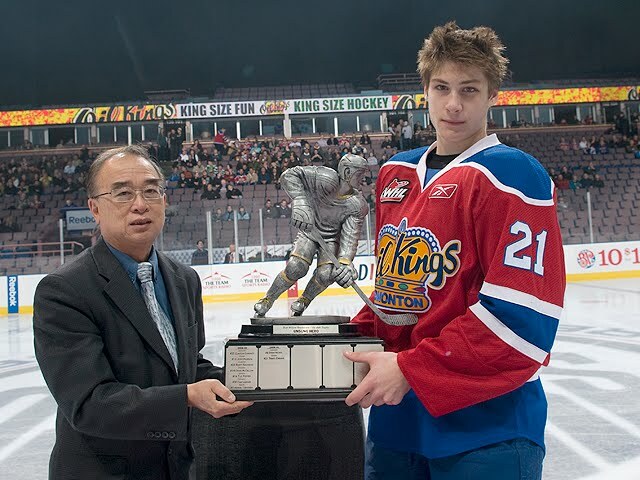 While I'm no scout in the least, I've seen countless Oil Kings games over the course of Ewanyk's career from the time he broke into the league. He's clearly a player that would skate through a wall to win — the high-motor, high-energy, stop-at-nothing type of player that I documented that had higher odds of ascending the ranks. Now, I'm not saying he's going to be an NHL player. Not in the least. A lot of things have to go right for Ewanyk to beat his 10% odds, it's pretty clear the offense isn't totally there with him at this point, and it probably won't ever be. He has struggled to put up over 30 points in a season, there's no denying that. However, at face value, that doesn't take into account his injury last year, which caused him to play only 11 games. Then he was befallen by another injury in game one of the Subway SuperSeries this season which caused him to miss a decent number of games, playing only 58. He had 27 points in those 58 games, which over a 72 game pace is 34 points. I've embedded his stats below. The numbers aren't an exact match but similar enough, and that's almost spot on with Ewanyk's scouting report from what I gather. Thompson went on to play three years in the minors posting nondescript point totals of 18, 23 and 39 points respectively before finally breaking into the league, and has since posted a career high of 25 points in the NHL. Now, once again, I should disclaim I'm not saying Ewanyk is a surefire NHLer in the least. But his chances are probably over 10% right now with factoring in signing his ELC along with his style of play — so he's already beating the odds. If he ever plays in the NHL it's going to be in a Thompson or Dale Weise-type capacity of providing speedy checking. There's also more roster spots opening up for that type of player in this era where the enforcer is going extinct. Referencing my study again, a lot will be contingent on Ewanyk's mental fortitude. Maybe I'm biased towards him because, first of all, he's an Oilers prospect, and second of all, he's an Oil Kings player. However, he has battled back through an awful injury/surgery/rehab last year and played extremely hard in his limited role in the championship-run last year — handling his "demotion" without pouting whatsoever . For a third-round NHL draft pick to be playing grinder minutes on his junior team and still not letting up or showing any signs of frustration, and actually embracing his role, is a good sign and preparation for what he will encounter in the minors. The flip side of that is, being from St. Albert, Ewanyk has never really lived away from home. He's always lived in his comfort zone, going to school with his buddies, hanging out with his childhood friends and getting meals from mom and dad — life will be a lot different in Stockton or Oklahoma City next year or the year after. That didn't seem to affect Mark Pysyk at all in his transition to pro, but it is a case-by-case basis as always. Side note: the impression Ewanyk left in my mind playing with the best of the WHL against the best the Russians had to offer in the SuperSeries was something I can't erase from my mind. He came out with such an unbelievable energy and spark and ramped up the physicality unbelievably high. It definitely left a lasting impression; even though it was half a game, I won't be forgetting it any time soon. In a Twitter conversation, Bob McKenzie seemed to agree with that assertion and alluded to Hockey Canada possibly agreeing as well. But I digress. Once Ewanyk gets to the minors, nobody is really going to care that Ewanyk missed precious development time in his junior career from injuries. Nobody's going to be there to baby him and help him through it. Hockey is a cutthroat business where every player wants the next player up on the depth chart's job. If Ewanyk finds himself getting squeezed out of the roster and buried in the ECHL next year, I'm probably not going to have a ton of hope left for him, but if he can make a great first impression on Coach Nelson and quickly, emphasis on quickly, establish a niche as a go-to speedy, physical checker that brings energy, PK ability and some defensive awareness, he can probably get on the right track to a call-up in a few years if he can maintain that play. An alternative course of action is to let Ewanyk's ELC "slide" for a year and have him play in the WHL as an overage player to maybe salvage some of that lost development time to injury. I'm not too hot on overage CHLers ever becoming great pros but maybe it's a different scenario here. Ryan Callahan did it (but under contractual circumstances); my draft work showed that it's not unheard of for players to play overage years and come out successfully. As Jarmo says, player development should be approached on a case-by-case basis, and my gut tells me at this juncture that an overage year might be the best course of development for Ewanyk. However, there's lots of hockey to be played yet in this WHL playoff run (hopefully), a development camp to go through in the spring and a training camp to undergo in the fall, so it should be evaluated on an ongoing basis. In conclusion, I don't think this contract is as big of a "waste" as some people are making it out to be. You could definitely do worse. If he doesn't turn into an NHLer, he probably becomes a great AHL teammate and leader in OKC, something that's a plus in your organization and doesn't show up on any stat sheets. Travis Ewanyk's NHL destiny is all up to Travis Ewanyk, and it should be interesting to follow his progress.